Neenah, WI - J. J. Keller & Associates, Inc., the nation’s leading provider of regulatory, safety and compliance solutions, announced it has been certified as a great workplace by the independent analysts at Great Place to Work®. J. J. Keller earned this prestigious credential based on extensive ratings provided by its associates in an anonymous survey. The company is one of only 16 organizations currently recognized by Great Place to Work® in the state of Wisconsin. Keller-Krikava’s grandfather founded the company in 1953 as a one-man consulting firm. His vision was to build a team of associates with shared responsibilities and shared results. As a family-owned business, J. J. Keller has stayed true to this “Associate Principle” along with a core set of values and strategic beliefs. These have served the company well. Today, the company has grown to more than 1,400 associates in the Fox Valley as well as remote work locations across the United States. The Great Place to Work Institute recognizes that every organization has a story that makes it unique. Using employee feedback through the Great Place to Work Trust Index© Survey, organizations are assessed based on five principles – credibility, fairness, respect, camaraderie and pride – that define the overall concept of what an employee views as a great workplace. In addition, a Culture Audit© Management Questionnaire polls employees on nine primary practice areas that define a great workplace. "We applaud J. J. Keller & Associates, Inc. for seeking certification and releasing its employees' feedback," said Kim Peters, Executive Vice President of Great Place to Work's Certification Program. "These ratings measure its capacity to earn its associates’ trust and create a great workplace – critical metrics that anyone considering working for or doing business with J. J. Keller should take into account as an indicator of high performance." This is J. J. Keller’s second year earning certification as a Great Place to Work®. To learn more about what makes J. J. Keller & Associates, Inc. a great place to work, visit www.jjkeller.com/company or www.jjkeller.com/careers. Serving more than 600,000 customers, including 90% of the Fortune 1000® companies, J. J. Keller & Associates, Inc. is the nation’s leading provider of regulatory, safety and compliance solutions. Organizations of all sizes rely on our expert insights to help create safe work environments and simplify the complexities of regulatory compliance. Our diversified portfolio of solutions and services, including electronic logging, mobile technologies, online management tools, publications, training, forms, supplies, consulting and professional services, is trusted to safeguard workers, reduce risk and build operational confidence. As a privately-held, family-owned company since 1953, we are committed to helping protect lives every day. www.jjkeller.com. Great Place to Work® is the global authority on high-trust, high-performance workplace cultures. 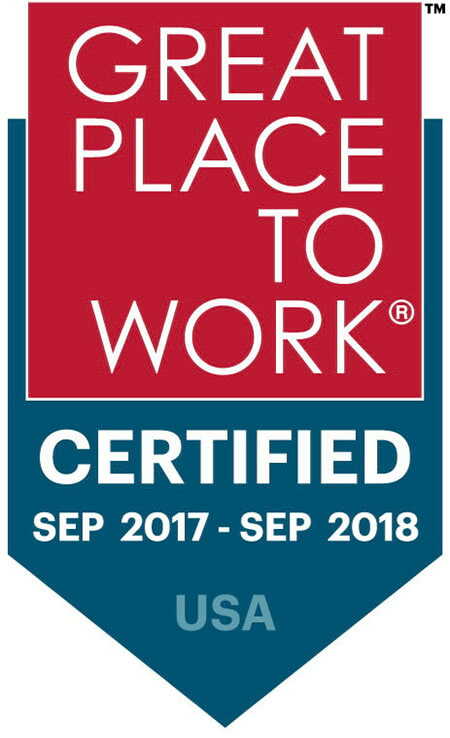 Through proprietary assessment tools, advisory services and certification programs, including Best Workplaces lists and workplace reviews, Great Place to Work® provides the benchmarks, framework and expertise needed to create, sustain and recognize outstanding workplace cultures. In the United States, Great Place to Work® produces the annual Fortune "100 Best Companies to Work For®" list and a series of Great Place to Work® Best Workplaces lists including lists for Millennials, Women, Diversity, Small and Medium Companies and over a half dozen different industry lists.